I'm Shelf-ish: Beyond Duty by James DeVries Book Blast - Win a $25 Amazon Gift Card! Beyond Duty by James DeVries Book Blast - Win a $25 Amazon Gift Card! The continuing story of Lt. Jeff Lacy is dangerous and sad. 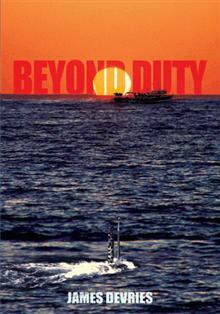 The story opens with Jeff's participation in a Top Secret mission to observe Russian Submarine missile tests. When he has a change of duty station Jeff lands in the middle of a dangerous plot and his beloved wife Molly is killed. In despair Jeff retires from the Navy and soon finds himself working as an agent for the CIA in the United Arab Emirates. While there he becomes partners in the Mid East Construction Company which leads him into unexpected and interesting situations. Jeff finally tracks down Molly's killer. Lt. James DeVries, USN, Retired, served 21 years in the Navy, 10 years in the submarine force and time in Special Warfare. The last year was with a Navy SEAL platoon setting up and operating a training facility on the island of Crete in the Mediterranean. Jim's retired years have been spent working as an International Field Service Engineer and 16 years for Fluor Daniel, Inc. as a Project Manager. Now fully retired Jim spends his spear time involved with amateur radio and writing. Jim and his Red Headed wife Claire live in Salem, Oregon in the summer and Mesa, Arizona in the winter. James is giving away a $25 Gift Card! This giveaway begins July 27 and ends on August 7. Winners will be contacted via email on August 8. Deception and The Siren's Touch Book Feature! A Little Boy's War by Roy Bartlett Book Blast! He IS Real by Janis Bolton Drinnon Book Blast! Ella by Virginia Taylor Cover Reveal!